On our last trip to Japan, we spent the majority of it in Tokyo, so this time around we were curious about areas outside of the metropolis. Queue in Mt. Fuji, or Fujisan, as locals call it. In Japan, the mountains are often called -san at the end of their name because the Japanese believe everything has a kami (spirit), so it is given the honorary -san like "Mr. Fuji". Weird sculpture, check. konbini snack, check. Lake view, check. While this area is pretty, I can say that the Chuckanuts still beat it out. By following the directions by this travel blogger, we were able to navigate to Kawaguchiko, the area with the best view of Mt. Fuji--assuming you can see it. Once we arrived, we were pretty certain we wouldn't be able to see Fujisan, but we decided to walk towards the lake and have a picnic. On the way over we stopped by a little anime shop, and it was my first (and only) experience having to take my shoes off to shop in a store. I've had to take my shoes off to try on clothes in fitting rooms for some of the smaller boutiques, but never to simply walk around a shop. We stopped by the supermarket to grab some snacks on the way to the lake. It certainly wasn't a fancy meal, just croquettes and other konbini (convenience store) snacks. After taking a few snapshots, eating our lunch and walking up a hillside to see the lake view, we made our way to the station. It should be noted that the only area map we saw was one that was created and sponsored by the local sake brewery. We did make a stop by the brewery where I had to convince Ian to buy some sake for his godmother, as he was concerned that he wouldn't be able to bring alcohol in his luggage back to the US. In case you're wondering, you're allowed to bring up to 1 gallon of alcohol as long as it isn't something banned like Wormwood Absinthe or that cobra scale booze famous in Okinawa. Anyways, it wasn't really the sake that mattered, it was the fact that the bottle was cute because it was shaped like Fujisan. 😝 The time we spent in Fuji wasn't more than about two hours, but it was still a really nice reprieve from the hustle that is Tokyo. When we got back to Tokyo we decided we'd grab ramen at a couple shops in Tokyo Station. There is a "ramen street" under the station, named as such because apparently one shop opened up, and then another and another and they all competed. Also, it's not really a street so much as a restaurant corridor because when Japan makes a subway station, they're also making a shopping mall/food court/art gallery. The first restaurant I chose wasn't actually part of ramen street, as I assumed, but the displays looked so yummy. Unfortunately, the ramen was not very good. While ramen noodles are originated in China, apparently Chinese-style ramen is not my fortè. We then went to another shop, Rokurinsha, that was rated as the most popular in Ramen Street, with about a 30 minute wait in line. The style of ramen was called tsukemen which is where you're served the broth and the noodles cold on the side. You then dip the cold noodles in the hot broth and slurp away. While Ian had tried tsukemen, it was my first time and I can't say I was much of a fan. Oh, well. Win some, lose some. Just a typical subway station. Really, though. Cute desserts, Ramen Street and artwork. All normal things at a subway station, right? 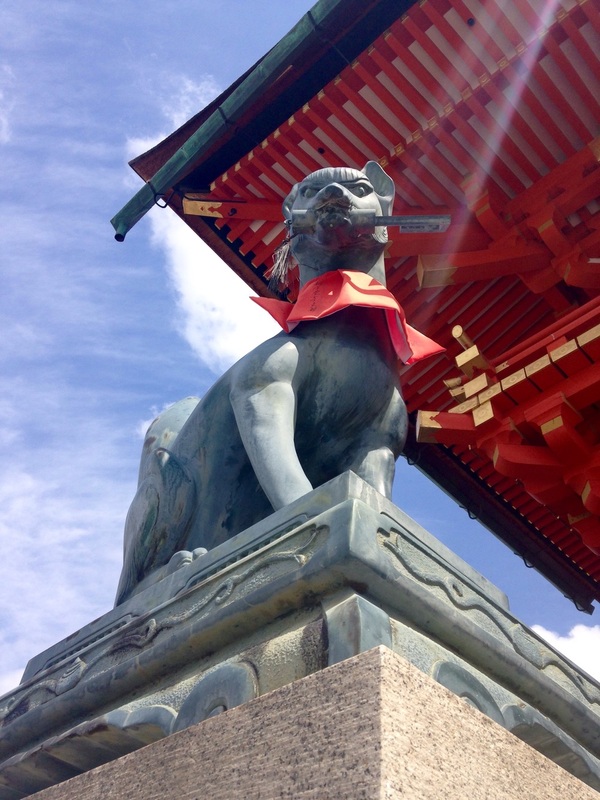 Because we had such a great time in Asakusa last year, Ian was interested in revisiting for some people watching. It was less sunny than the last time we went which I think changed the mood of the visit to a certain degree. We were interested in checking out the streets we didn't go down previously. We had hoped to get lunch at Suki 6 Diner, a restaurant that looks like it's trying to be Portland, but being a Monday, it was closed. :( We ended up grabbing a Katsudon lunch in a traditional style restaurant that had been there for more years than I can remember at this moment. Then we wandered the streets and enjoyed the scenery of people, though avoiding the gaze of any monks as the year before we were conned into buying prayer bracelets. Essentially, these 'monks' hand you a wooden beaded bracelet and then ask for a donation. I recall thinking it probably wasn't worth much so I offered 200 yen, to which they insisted I pay at least 1000 yen. So, naturally, we avoided that scheme any time we were approached. Because if you're going to name your street, Orange Street, you better have a mascot, too. We then hopped over to the Skytree since we both wanted to see the new items at the Studio Ghibli shop. I also maybe spent a good 20 minutes in the character shop as well. Can't be helped. 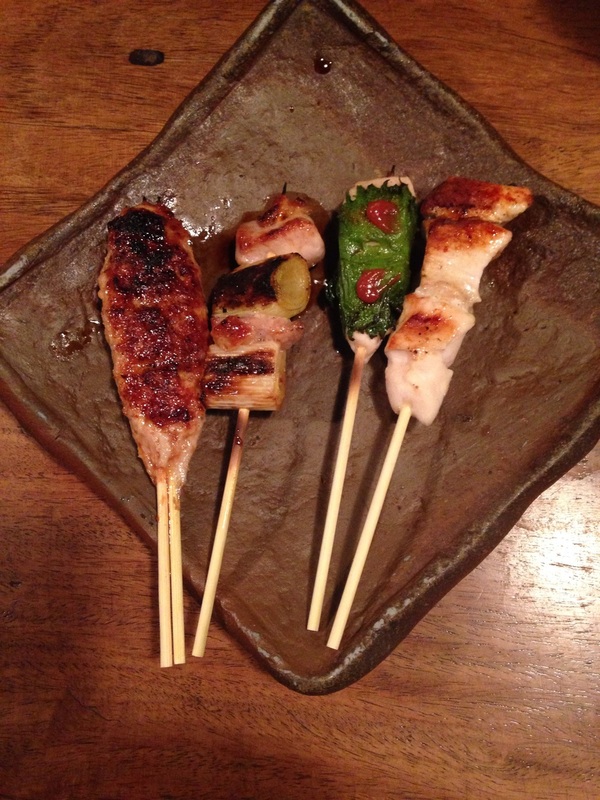 We bounced back to Asakusa main area and grabbed dinner at a yakitori restaurant we discovered last year. Ian had not wanted to go in last year, but I insisted it looked good, and sure enough it was. We returned right when they opened at around 6pm and the lady said she recalled us from our visit a year ago. As we had hoped, it was super yummy. We headed back to our sharehouse and on the way were struck by a hailstorm. Luckily we are smart and brought both the Sailor Moon umbrellas Ian had purchased for me for Christmas. As we ran down the street, the lady who owned the fruit shop thought our matching umbrellas were adorable. The hail was actually pretty heavy and the stones were pretty big actually. Once the storm had passed we took a stroll around the neighborhood before turning in for the night. Katsudon for lunch and yakitori for dinner. The set up of greasy pots & pans somehow reminds me of Howl's Moving Castle. Ok, I've been absolutely terrible about updating this after the first week in Japan. I've just been so busy everyday, running to this thing or that thing to see the sights, eat the food, meet the people, watch the events. And throughout my day I think, "Oh, man, I can't wait to show this to everyone" but then by the time I get back to my homebase the only thing I want to do is shower and pass out, assuming I don't have any client work to do. That said, I think I'll be able to update this more often, so in the meantime, I'll spend the next couple days putting up multiple posts to get caught up. Saturday morning, bags packed, we headed to Kyoto Station to catch our Shinkansen to Tokyo. At last! While Kyoto was a beautiful place, I was happy to go to a city I knew the layout of better. With an ekibento purchased moments before, I was ready to spend the next two hours getting caught up on client projects while Ian napped. When we got to our AirBnB in Shinjuku, it was a little disappointing. We knew it was a sharehouse type place, but we assumed when we purchased a "Private room" that we would have our own room, not a room shared with 4 other people. Even that wouldn't have bothered me, but they didn't even have lockers for me to store my computer which meant we had to carry my laptop in the backpack everyday to ensure its security. That said, our hosts were still kind and we got to meet a lovely couple from Australia later in the week. Anyways, once we dropped off our non-valuables, we were off to Ueno Park where we had hoped to run into a group of gentlemen we had met the year before during hanami (basically an excuse to drink and eat food under the sakura blossoms all night and day). They said they came to Ueno every year and I told them last year that I would come back. I'm sure they didn't think I meant that, but I figured I'd still try to find them and surprise them. But with no way to contact them it really was a shot in the dark to try to find them in a haystack of drunk middle-aged businessmen. After walking around for about an hour searching, we sorta gave up/were distracted by the art display of kaiju (big monsters like Godzilla that the Tokyo University of Arts in Ueno had put together. There were two performers playing shamisen and singing traditional Japanese music accompanied by an utsushi-e visual. Utsushi-e was an art form created as a result of Western technology being introduced to Japan. The Japanese were skeptical and believed that photographs stole a part of their soul (horcruxes, basically) but they thought the technology could be useful in communicating visually, sort of like a precursor for the anime we know and love today. Next up was a rakugo storyteller and although I speak very limited Japanese, between the visuals and Ian translating I was able to gather the overall story. Eventually we made our way back to Shinjuku and decided to stop into a ramen shop called Kuma near our sharehouse and I was delightfully surprised to discover that the strong pork jelly flavor was almost as wonderful as Bankara, my very favorite ramen-ya located in Ikebukuro. We even got to talk to our cook who had spent a year in Seattle for school. And we also got to see a man fall asleep in his ramen bowl after what i suspect was a little too much hanami. A menacing kitsune at the entrance to Fushimi Inari shrine. Day 4 began in a cozy, warm room and it was never warmer thereafter. Knowing how warm the northwest is becoming, I truly didn't prepare for the coldness that is Kyoto. Once again, we had to deal with the terrible transportation system that doesn't really assist foreigners. So when you find out the bus isn't going where you intended you jump off and try to find an alternate route. Eventually we made it to Fushimi-Inari, a torii-filled shrine I have wanted to visit since I watched Memoirs of a Geisha. Like the days before, my foot was still in pain, but that didn't stop me from wanting to reenact one of my favorite scenes from the film. I didn't know that Fushimi-Inari was actually a shrine filled with kitsune (fox) statues as opposed to the shishi (lion dogs) at each torii (gate). Also, I didn't realize that there were multiple shrines to see along a mountain. Because it was a pretty light traverse I had ambitions on making it to the top to get a photo of the view of Kyoto, but that hope was quickly dashed as my right foot began to give out and we became pressed for time if we wanted to make it to Kiyomizudera at a decent hour. So once we reached the halfway point, there happened to be a view that I openly told Ian was "good enough for me." An English speaker heard me say this and had a laugh. Throughout the day this more or less became my quote. The view from halfway up is good enough for me and kitty. Also, I didn't make it to Tōji temple, but I could see it. Tōji temple houses the tallest wooden pagoda in Japan. Good enough. After we left Fushimi Inari, we made our way to Kiyomizudera, that is after we stopped for some udon. Kiyomizudera is a UNESCO World Heritage site that has a brilliantly orange entrance, and was made without a single nail. In fact it's probably for this reason it was under restoration in the main area which was a bummer, but it was still beautiful from what I could tell. Other notable mentions in Kiyomizudera were the shrine for business luck being a big fat black Buddha type figure, a housed horse statue with business cards thrown into the housing, a shrine for the love god Ōkuninishi symbolized by rabbits and a man with a hammer, and a tree filled with nails representing the "2am visit" death curse that women wished upon the men who betrayed them. Maybe they wouldn't have to constantly restore the building if they used some of those nails for things other than curses. 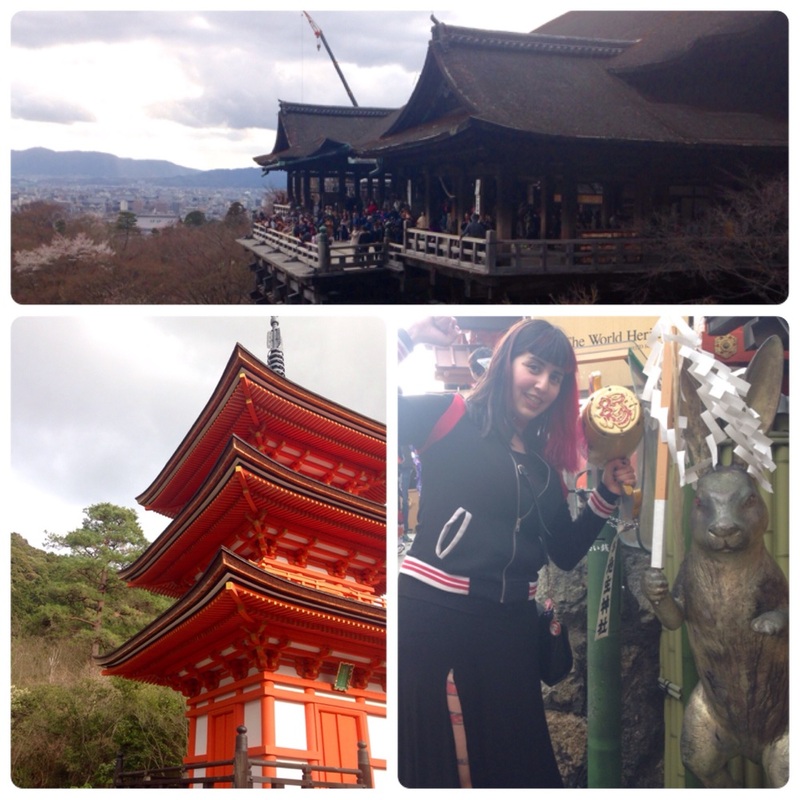 The main shrine on top, a pagoda and me with the love bun. Once we left Kiyomizudera we continued to walk up a path filled with shrines and shops in hopes of reaching Yasaka Shrine. It's really, really easy to get distracted however when there is a shrine every 20 steps though. We found an unmanned building with weird art sculptures and the request that if you take photos that you pay the frog. We passed a pagoda that I'm sure was important, but entry was barred as it seems most shrines close between 4-5pm. It seems a lot of things shut down early in Kyoto in contrast to Osaka and Tokyo, though Ian and I are sure that is due to how cold it is in Kyoto. We saw a big Buddha statue from afar that initially I wanted to see up close, but after realizing I'd need to walk a bunch to pay to see a statue that I could clearly see from afar I decided once again that my view was "good enough." We continued on and stumbled into a double-temple exhibit. One was Entoku-in and the other was Kodaiji. 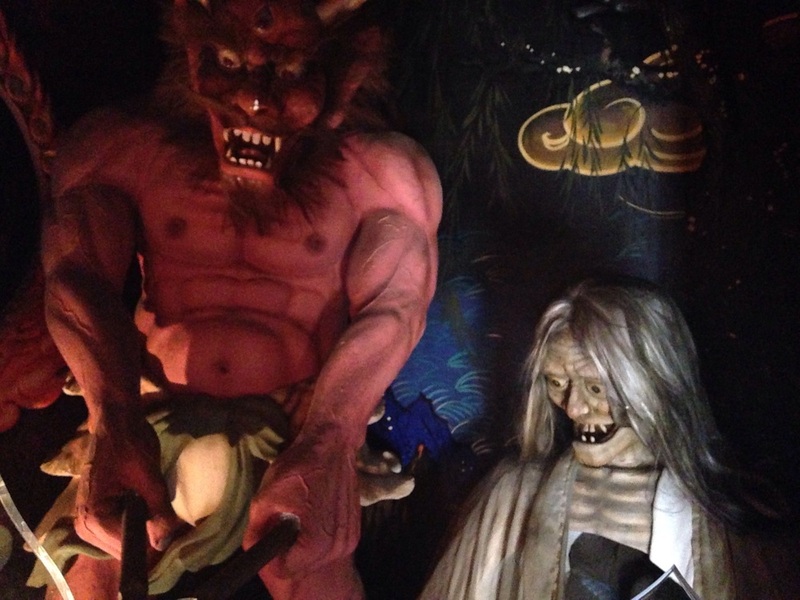 Entoku-in was created by Nene, the wife of Hideyoshi, to mourn his death. Samurai would pay respects by bringing Nene big rocks for her North end garden. I also got to see (but not photograph) a screen painted by the famous painter Hasegawa Tohaku. By the time we left Entoku-in and walked over to Kodai-ji it was almost dark, but that's okay because both were lit up at night. While it would be lovely to see the garden during the day, we were surprised with the rock garden being lit up with a 2 minute show projected on the rocks and building. We then walked around the lit bamboo forest which was beautiful and reminded me of Miyazaki's The Tale of Princess Kaguya. Cherry blossoms falling over water before the dragon arrives. Beautiful bamboo forest, no filters or editing needed. We never did make it to Yasaka shrine before closing, but with all we did, it was good enough. Also, I would have liked to see Gion in the day, but again, decided it was good enough and that perhaps the night scenery was closer to the romanticized vision I have of it as there were less tourists and gift shops. Finally we ended our night with dinner at a restaurant in Gion, eating different sticks of yakitori, karaage, and drinking Mikan chuhai. It was probably my favorite meal in Kyoto so far, though none of the food in Kyoto has been bad. Definitely better than good enough. The third stick was my favorite, wrapped in shiso with plum sauce. "I hate Kyoto..." or at least its transportation system. So maybe you noticed I named yesterday's post Day 2 + 3... Well, I totally forgot about day 3 because day 2 was just so jam-packed with awesome that day 3 paled in comparison. Part of that is because it was a travel day from Osaka to Kyoto. In the morning, Joe-San took us to Dotonburi with our luggage so I could go to the Ukiyo-e museum that was closed the day before. He gave us a very heartfelt goodbye and I can say out of my time here in Japan so far, meeting him has been my favorite part. Joe used to be a boxer in Korea, has two adorable daughters that I got to FaceTime with after they went to Sento with their mother, and he shared a lot of his interesting life story with us. Joe-San has great taste in noodles, too. AND he used to play part-time with my favorite Japanese rock band, Thee Michelle Gun Elephant and hosts a show on Osaka's television network every Friday night featuring musicians from Japan. One day maybe Tin Foil Cat can be on the show. 🙏🏼 His smallest daughter is already a fan! We browsed through the museum and I enjoyed seeing the original woodblock prints that inspired so much if my favorite art. We then headed to Osaka station to make our way to Kyoto. The train ride was pretty short, but it took forever to get on a bus to take us to a bus stop that would let us ride a bus to our next AirBnB. The part that made it so miserable was that while Japan is filled with tourists, they seem to be a lot more pushy and rude in Kyoto. Likewise, the city just doesn't seem as friendly as Osaka, because well, Osaka really is the friendliest in my experiences in Japan so far. The destination was really only 15 minutes from the main Kyoto Station, but the public transportation system in Kyoto is far less efficient than anywhere else I've been in Japan, so it took us about an hour and a half. After we dropped our things off and took a short nap, we decided to tackle the central Tokyo area where Pontocho & Nishiki Market are since all the temples, shrines, and gardens would be closed by 5. Even this was quite a feat because all the maps in Kyoto seem to be turned every which way depending what direction you're facing, what the scale comparison is on destinations, and the fact that each bus, subway, and train company refuses to share a map system so you're stuck comparing multiple maps to see if you can reach your destination with any possibility of ease. (Yes, I know that was a horrible run on sentence.) The frustration this all caused had me constantly saying "I hate Kyoto" which is surprising when anyone I've ever met will say Kyoto is their favorite city in Japan. Another note, when in doubt about whether you're on the right bus or not, you're probably better off walking. The main highlight of this day was our dinner. And that's pretty much it. We could have played with Bengal kittens, but we were too hungry for that. After staying up late with Joe-San on Monday night, we woke up around 11am and headed out to Senkouji Temple in Hirano. On the walk to the train station from Joe's house it was nice to see the shopping arcade open and full of life. In Japan, arcades are long strips of shops & restaurants, mostly owned by small business owners selling anything from convenience store items, flowers & plants, blankets, towels, souvenirs, clothes, etc. I'd venture to say there are probably never less than 100 shops. Anyways, once we made our way to Hirano, it was mostly a residential area, which was nice because we could witness the day-to-day life for Osakans. Such as a little boy who clearly forgot to put out the garbage and had to chase the garbage truck down the road and then beg to be let into his house after failing to complete his task. There was also an older woman paddling her bedding as it dried over her back porch bannister. Another thing about Japan is they usually dry their clothes outside on their porches rather than have dryer machines. When we arrived at Senkouji it was definitely one of the most unique and beautiful shrines I've seen, even in my last trip. There was absolutely no English on any reading materials, so I imagine it's mainly for Japanese folks. The temple was created sort of as a museum to teach people about the consequences of their actions and to give you a fortune if your decisions in life will lead you to heaven or hell. Ultimately, the real lesson was that you are in charge of your own fate. Because I can't read Kanji, I couldn't do the quiz that would tell me my fate, so I'll just assume I need to live my life in a way that is good to others. 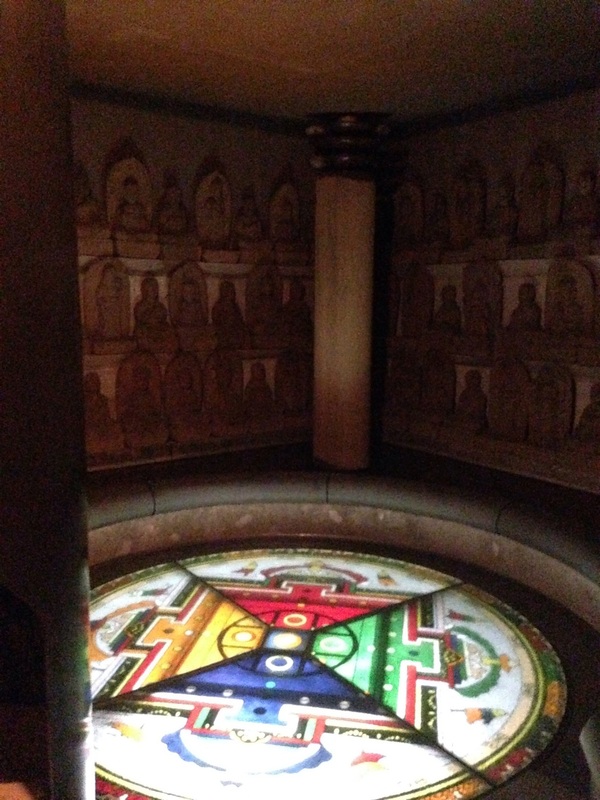 :p My favorite part of this temple was the weird underground room that had small statues around a beautiful backlit glass floor. It reminded me of the fairy fountains in Zelda and I just imagined the Great Fairy rising up in laughter. Please give me Farore's Wind or Din's Fire. Also, could you heal my sore ankle? After we left Hirano, we headed to Dotunburi, a large shopping area on the river. When you've seen so many shopping areas in Japan, they stop being exciting. Though I still enjoy the search for unique Gashapon and food. We ended up eating some kushikatsu, deep-fried veggies & meats before embarking on a twenty minute tour of Dotunburi on the river. LINDSEY!! Check out the climbing wall in the middle of the building in the city! I wish I could climb it with you! As for the Glico running man, no one really knows the history, but Glico is the company who makes Pocky. This was a nice break for me because the night before I started to feel pain on my right foot/ankle. Honto ni (truthfully), my foot has hurt since day one, but I can't really let it heal because there is too much I want to see in Osaka and Kyoto. I will relax it when I get to Tokyo. 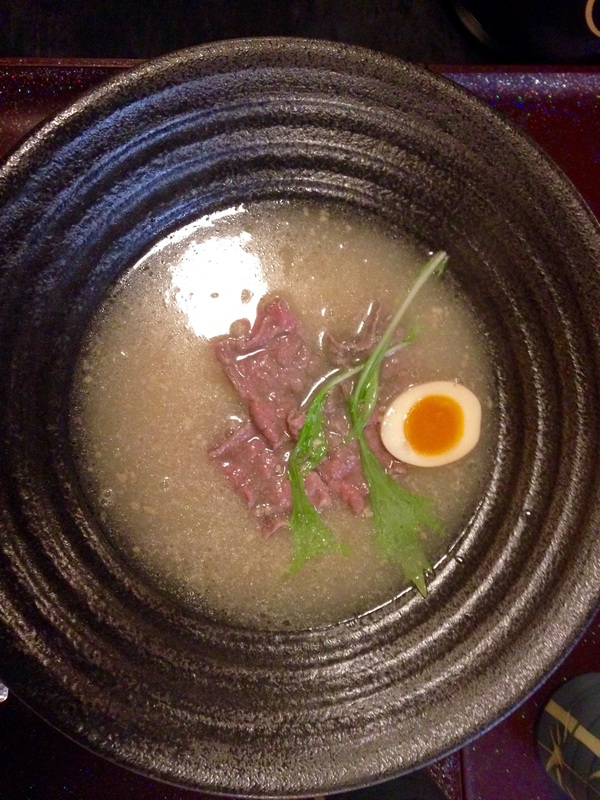 After our river ride, we shared a bowl of ramen with Kobe beef. You pour the hot soup over the Kobe beef slices to cook it. The ramen broth was pretty good, could be a touch saltier, but the Kobe slices were just okay to me, honestly. 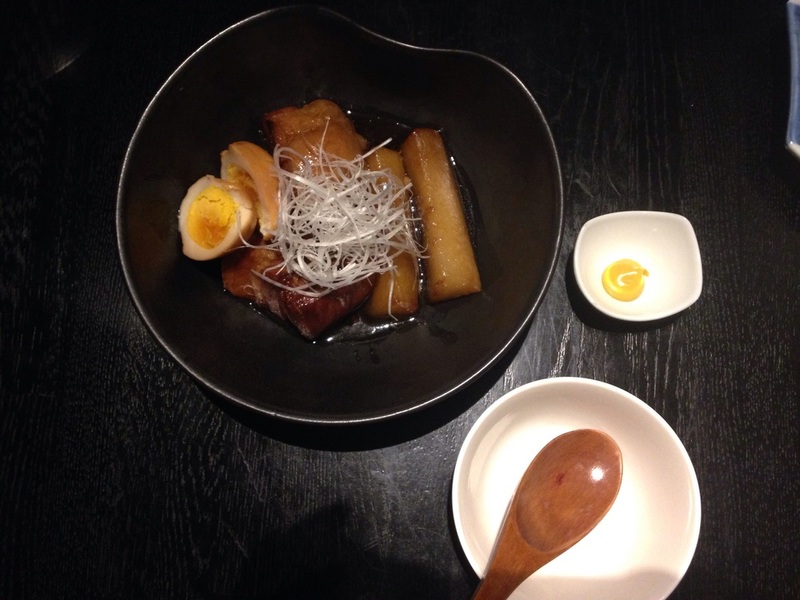 I still prefer chashu pork, though. Kobe beef cooking in ramen broth. After sharing a bowl of ramen we headed to Osaka Bay Area to go to the Osaka Aquarium, which is the second biggest aquarium in the world. I know the saying goes that everything is bigger in Texas, but I beg to differ--it seems everything is biggest in Japan. Besides boasting a huge aquarium, it also had a huge boat, the Queen Elizabeth the second that I could almost swear was the Titanic. There was also the Tempozan Ferris wheel which was even bigger than the one we rode the night before. I meant to get a photo of this huge Goliath of a boat, but it seems I was distracted by the smaller boat with lights. While I've been to tons of aquariums, being the daughter of a marine biologist, what made this one unique was that rather than having hundreds and hundreds of different species, each exhibit was focused on a different region of the world and created with the depths that said species were used to swimming in. For example, the area for otters would span about 2 floors, where as the area for seals was 3 floors, and for whale sharks and larger rays and hammerheads was about 4-5 floors. The main tank which housed those rays, sharks and larger fish apparently held 5,000 tons of water. Due to my foot hurting so much, I sat and watched them swim around for about 15 minutes, wishing so greatly to be able to breathe underwater so I could just sit there in the water and watch them endlessly. In fact, it seems I enjoyed this tank so much so, that I didn't even take a photo of it. Oops! Once we wrapped up our aquarium visit, we headed to Umeda where we were the night before because we wanted to visit the sky garden on the 40th floor. It was lovely, though the name was misleading as there wasn't really a garden, just a 360 view of the city, but that was pretty nice too. Joe-San, our AirBnB host sent us a message to try a delicious Udon restaurant that is famous to tourists and locals alike. So we headed over to the house and met Nick, a Korean gentleman (that happens to take great photos) who was just checked into the home that day. Together we all headed over to the restaurant (I'll get the name of it later). As always, Joe-San was a benevolent host, driving us to our destination, and ordering his favorite item. He has known the owner for about 18 years and the owner and his wife treated us all kindly. We enjoyed chatting with them while they cooked our curry udon meals. They asked us about the election in America and who we would vote for, explaining we were fans of Bernie, the reasons why, and we all had laughs on behalf of the ridiculousness that is Trump. Finally our food arrived and it was even better than I expected. I will admit I was never a fan of udon, but this was curry udon perfection. Not too spicy, noodles the right firmness, and little pieces of fried seaweed and negi. By the way, this amazing meal was being enjoyed by us at about 2am. Don't you wish you could eat this in America after a few too many drinks? Anyways, while I was absolutely exhausted and sore, I can't think of a better way to end the evening than with good food and new friends.